"how can somebody live in a lego city?" Finally!! C'est bon de revoir des dessins par là. copenhague c'est vraiment trop propre pour nous autres. sinon, c'est bon de voir que des gens continuent de se connecter sur ce blog malgré mon irrégularité et ma paresse notoire. Great drawing! 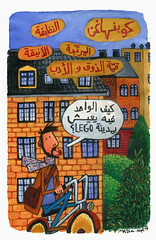 I live in copenhagen, and yeah, it IS a Lego city. my poor L, you know nothing about anarchic urbanism, raw cement buildings, dirt in the steets, noise pollution, suicidal driving, traffic jams, honks, shouting, insults, fights, vendettas and other joyful cultural signs. i really wonder how you can survive without this marvelous environment. "how can somebody die in an alter ego city?"